A North Wales theatre was alive with the sound of music thanks to singing sensation and West End star Connie Fisher who also had a pop at Simon Cowell. 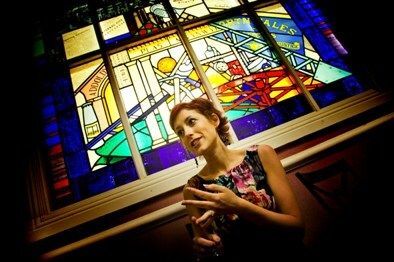 The Welsh songstress and actor berated the powerful TV mogul during a visit to the Stiwt Theatre in Rhos, near Wrexham. She was there to present a free community event which saw local schoolchildren working with some of Sinfonia Cymru‘s young professional musicians. Connie, 28, who won the hunt for a star on the BBC’s How Do You Solve a Problem Like Maria? to land the lead role in Lord Andrew Lloyd Webber’s massive West End show, The Sound of Music, was unhappy that the X-Factor supremo belittled the alleged lack of talent in Wales. Happily living in her beloved Wales, Connie says she hasn’t really had time to think about a return to the West End stage. She said: “I am just really enjoying being married and cherish living in the Vale of Glamorgan. I have just presented Cardiff Singer of the World alongside Tim Rhys-Evans for the BBC which I enjoyed immensely. I have also recorded a show for the BBC called Connie’s Musical Map of Wales which will air later this year. I thoroughly enjoyed making the show as it gave me a chance to get around Wales and listen to some fantastic singers”.